A name change for a housing association that needed bringing to life with fresh designs and branding. Just as we started working with Viridian Housing, they had undergone a name change from Servite Housing. Our challenge was to create a recruitment brand identity that would encompass the excellent reputation of Servite whilst communicating the new name of Viridian Housing and what the organisation stands for. WDAD reviewed the competitors in the market and their employer brands and some extensive internal research to establish what Viridian stands for, particularly in the Nursing marketplace. 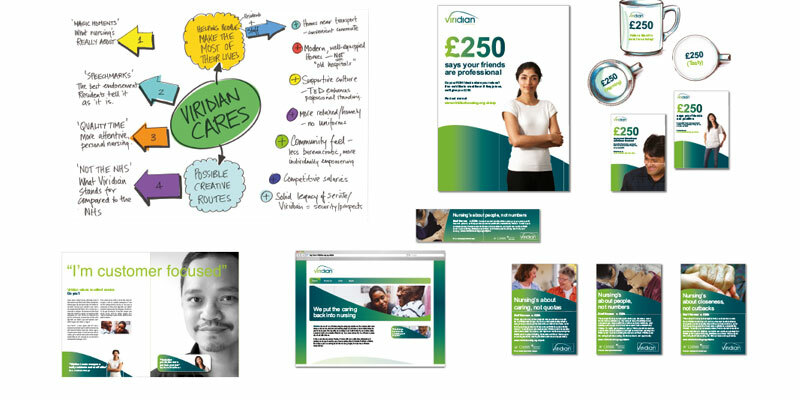 We stripped everything back and established a proposition that ‘Viridian Cares’ – this was our starting point to produce four different creative approaches with the underlying message of helping people to make the most of their lives – both residents and staff. All four campaigns were excellently received by Viridian – you can see our thought process and approaches in the images above.